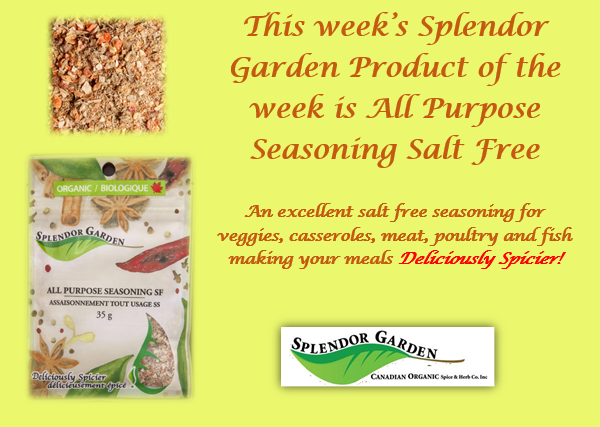 All Purpose Seasoning is Splendor Garden’s Product of the Week. Spices and seasoning blends add tremendous flavor to food without adding salt. 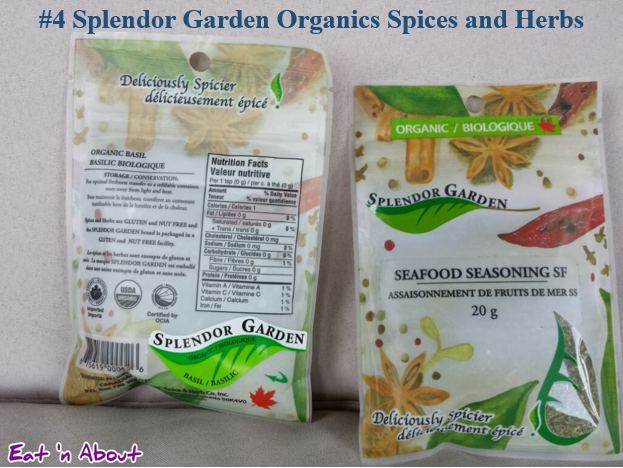 Try a variety of seasoning blends to enhance vegetable dishes, soups, salads, and main dishes. 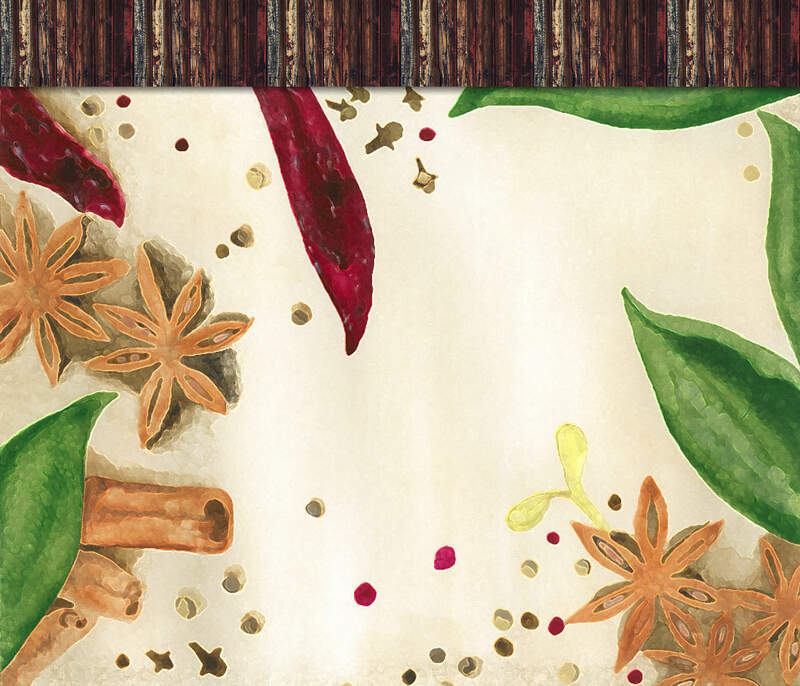 Many health organizations, including Health Canada and the Heart and Stroke Foundation of Canada, recommend the use of spices to give flavor to foods as part of a healthy diet. 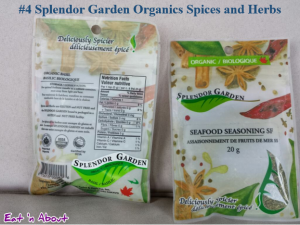 Splendor Garden’s spices, herbs and seasoning blends come from organic sources known for their quality and consistency around the world, including Asia, Europe, Africa, the Pacific Island nations, North America, South America, Central America, and Mexico. 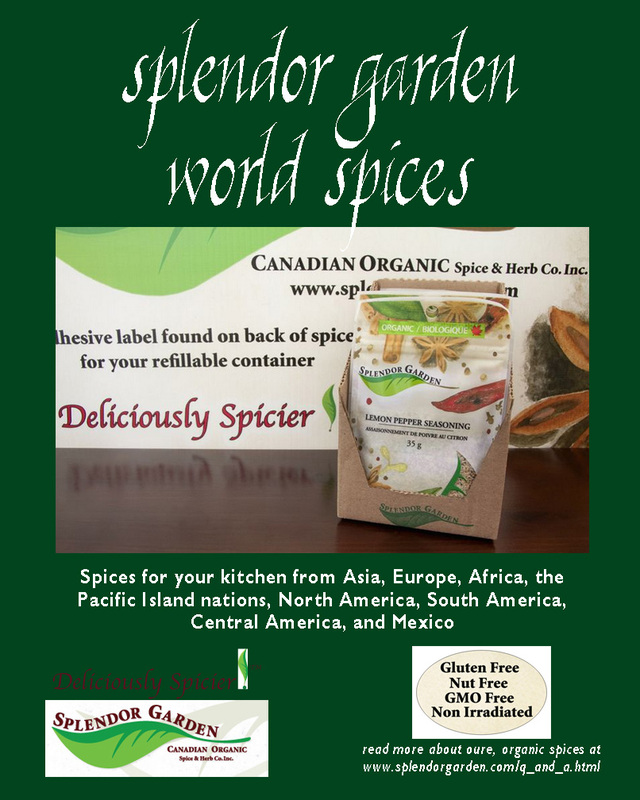 Worldwide, sales of organic spices are growing by 30% in sales each year, according to the Organic Consumers Association. 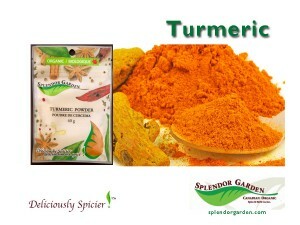 Peppery, warm turmeric’s bright yellow color enriches curries and “ballpark” yellow mustard. It also contains minerals like manganese and magnesium, and is used in traditional Indian and Chinese medicine to reduce inflammation. 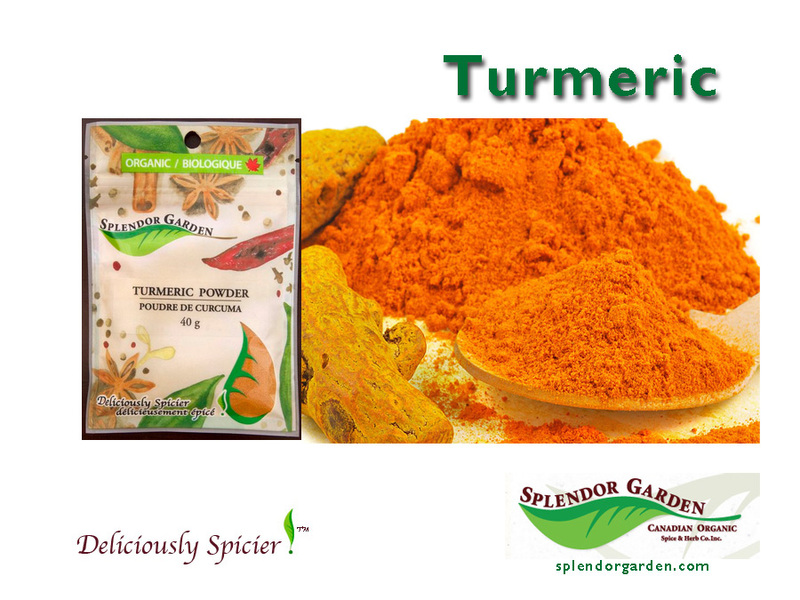 For tips and information about turmeric, visit our turmeric information page, and don’t forget to like our Facebook page! The information and reference guides are intended solely for the general information for the reader. The contents of this page are not intended to offer personal medical advice, diagnose health problems or for treatment purposes. It is not a substitute for medical care provided by a licensed and qualified health professional. Please consult your health care provider for any advice on medications. Thyme is pronounced exactly like “time” and has fueled charming sayings throughout history. 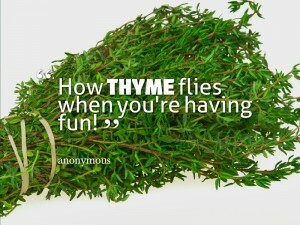 How thyme flies when you’re having fun! Be sure to make thyme for yourself and those you love every day. 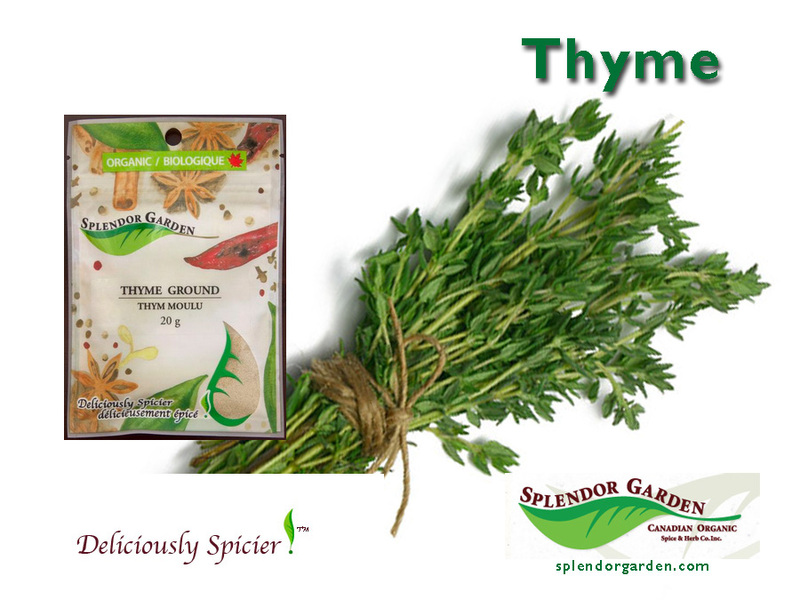 Learn more about thyme at Splendor Garden’s thyme page. Thyme, originating from Southern Europe, is related to mint. It is rich in essential oils, with a pleasant aroma and warm, pungent taste that enriches poultry, red meat, root vegetables, stuffings, sauces and soups. 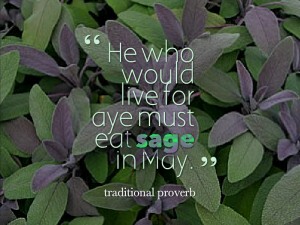 For tips and information about sage, visit our thyme information page, and don’t forget to like our Facebook page! Sage’s association with health and a long life has been a hallmark for hundreds of years. 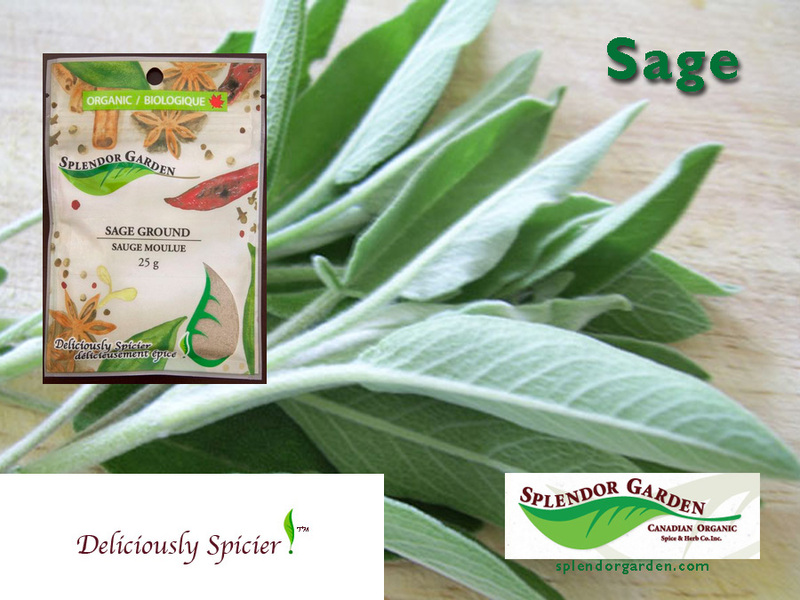 Learn more about sage at Splendor Garden’s sage information page. 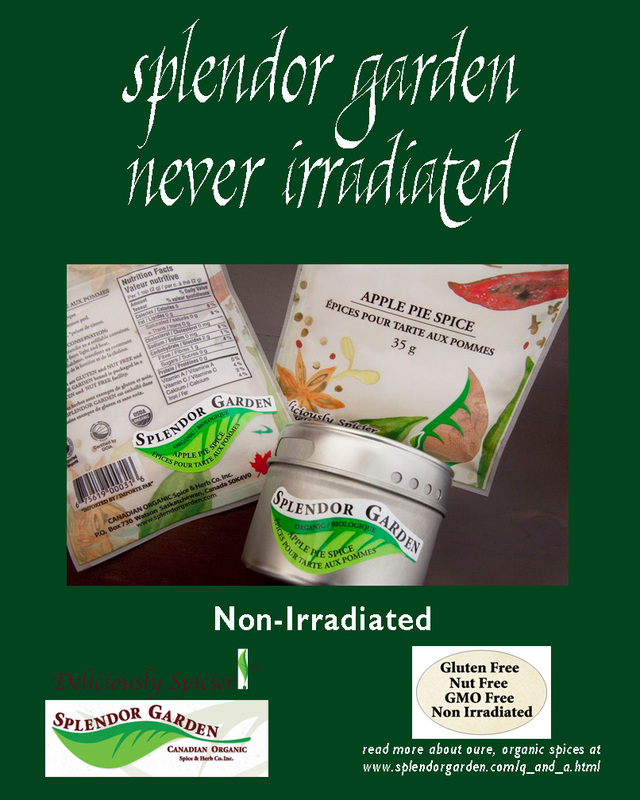 Splendor Garden made #4 of top 10 new grocery items for 2014 from Eat’ N About in Vancouver at the Grocery Show Case West on April 6 & 7th! Sage is SPLENDOR GARDEN’S spice of the week. One of the most fragrant herbs, sage is native to the Mediterranean. It shines in stuffings, meat and poultry dishes, sausage, Italian cuisine and as a delicious tea. To learn more about sage, visit Splendor Garden’s information page about sage, and don’t forget to like our page on Facebook and follow us on Twitter! The information and reference guides provided are intended solely for the general information for the reader. The contents of this page are not intended to offer personal medical advice, diagnose health problems or for treatment purposes. It is not a substitute for medical care provided by a licensed and qualified health professional. Please consult your health care provider for any advice on medications. You may read more about food irradiation in this article published by the Organic Consumers Association.